You've found the smartest way to book USA packages. Click a price below to see our unique "vacation grid". It's very fast and has a calendar format for easy comparison. 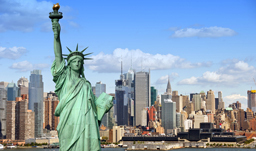 Our agents have been to United States - call us and we'll help you decide which hotel is right for you. Going on a USA vacation is a great way to explore the great North American landscape. Whether you fancy the idea of a quick getaway to weeklong city stays, we have something suitable for every budget and preference. From exciting destinations such as New York, Los Angeles, and Miami to the laidback vibe of cities like Santa Monica and Portland, the United States of America certainly offers it all. In a USA vacation, you can also come to explore iconic landmarks like the White House, Yellowstone National Park, the Golden Gate Bridge, and Statue of Liberty. For those itching to embark on a family vacation, experience the magic of fairy tales at Walt Disney World or meet your favourite movie characters in Universal Orlando. On the other hand, for some of the best dining, shopping, and nightlife, there’s no better place to escape to than Las Vegas! There’s so much to see and do, so go ahead and indulge. Where to Stay: Where you stay on your vacation is essential to a stress-free visit. We are here to guide you through the sometimes complex process of planning travel. Whether you wish to stay at a 4-star property like the Fairmont Battery Wharf or opt for a more budget-friendly option like the Comfort Inn 48th Street, we promise to help make your dream getaway as efficient and stress-free as possible. When you’re ready to book your USA vacation, give us a call at 1-800-665-4981!